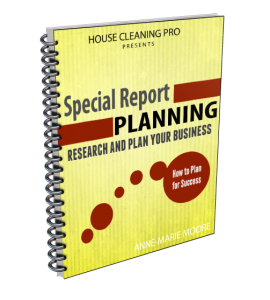 Special Report #2 $14.00 How to do the research to start planning or upgrade your residential cleaning business. Guarantee/Refund Policy: There are NO refunds on special reports or forms. If you have ANY trouble implementing these techniques and procedures, the House Cleaning Pro will provide you with one hour of personal coaching to guide you to success. I authorize House Cleaning Pro through GRM Business Solutions, LLC to charge me for the order total. I further affirm that the name and personal information provided on this form are true and correct. By purchasing this product/program, I agree that I have read, understand and accept House Cleaning Pro's business terms and policies as published on their website. I also understand the refund policy for this product and that NO refunds will be processed after the specified days (if a refund is available). Remember, the results you get from using the materials in this product/program are entirely up to you. We cannot promise or guarantee that you will have any results. Your results will depend on YOU and the actions that you take.